The Virgin Trains Pendolino Day was publicised heavily in the local area and I went along to see the new trains alongside the original APT, now repainted jointly by Virgin and Pete Waterman. The first disappointment was finding that I had to pay £13.50 for three people to gain admission to what was a Virgin Trains Press Call. The second was when I was ejected from a viewing platform (upper right) because it was "Press Only". I was directed to the signal box in the distance where binoculars were not provided. The Press members did not pay to get in. 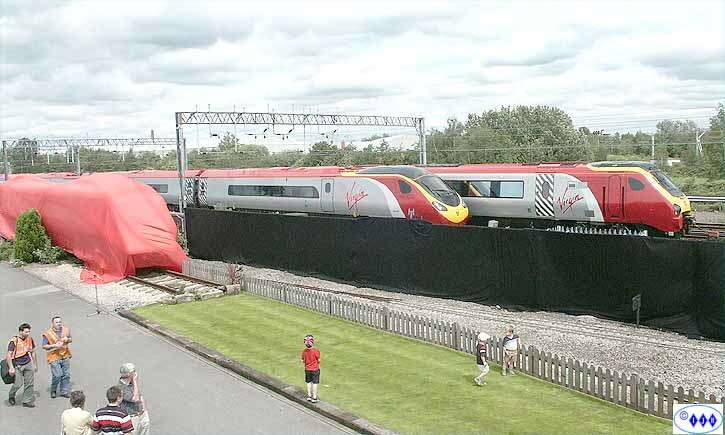 Before I was rudely ejected I managed to take a few shots, this was one of Pendolino 390006 conveniently hidden from ground level view by the Virgin Trains black shroud covering the fencing. Why was the train hidden from view in this way? 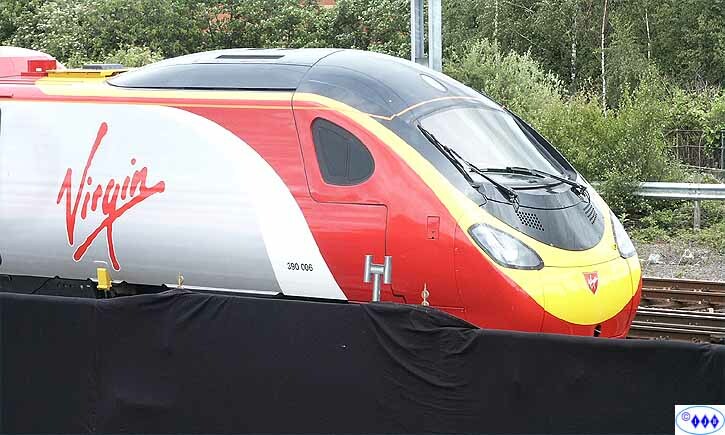 Why were people enticed to the site on the pretext that the Pendolino would be on view and does this contravene any consumer regulations? 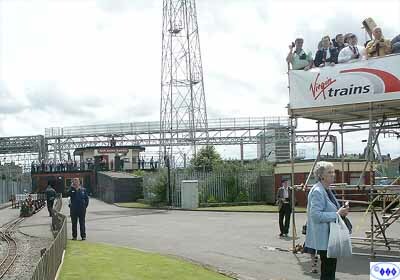 What could have been an enjoyable and successful day was spoiled by what appeared to be a lack of corporate feeling, it could be said that Virgin Trains snatched defeat from the jaws of victory. I also managed this compilation of APT 370003 under the red cover, Pendolino 360006 and Voyager 220010 "Ribble Voyager" en route North along the West Coast Main Line. Note the black screen. 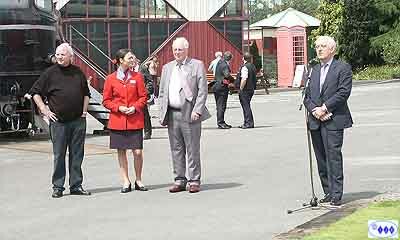 Pete Waterman (L) and Virgin Trains Chief Executive Chris Green during the speech making. 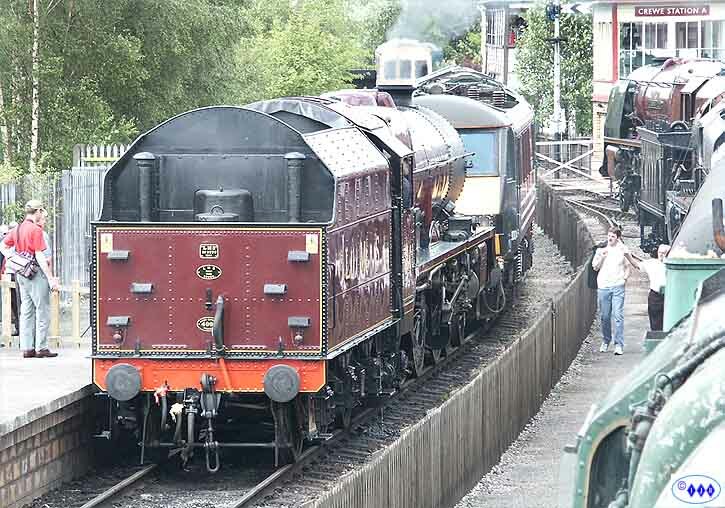 Afterwards I complained to Mr.Green that I had paid a not inconsiderable sum to gain entry to a PR exercise only to be prohibited from seeing the APT and Pendolino together. He listened politely and said he would see to it........guess what! The APT after unveiling, complete with working headlights. 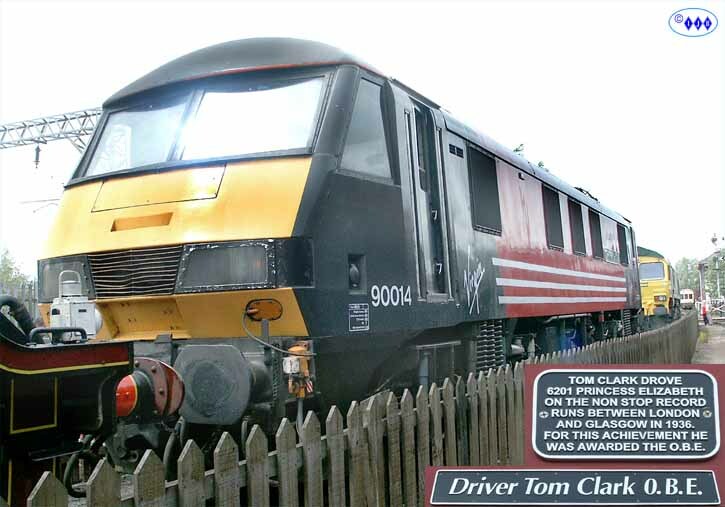 Another of the events of the day was the naming of a class 90 in memory of Tom Clarke O.B.E.. 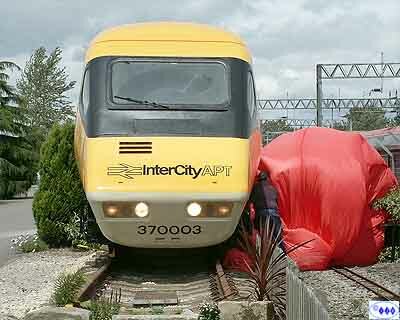 The locomotive was 90014 but I didn't stay for the ceremony, the day had turned sour. Freightliner's 66526 had earlier delivered the AC electric to the site and later removed it back into service. 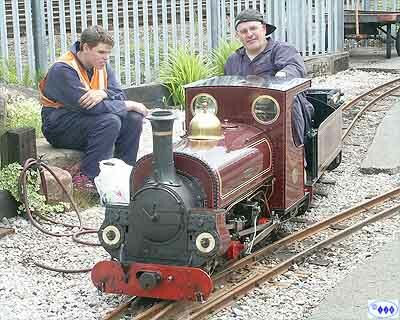 "Jenny" was providing rides around the site for children.